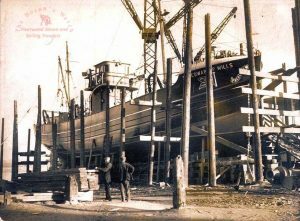 12.02.1937: Launched by Goole Shipbuilding & Repairing Co Ltd, Goole (Yd.No.324) for The Royal National Mission to Deep Sea Fishermen, London as Sir EDWARD P. WILLS. 31.3.1937: Registered at London (LO197). 4.1937: Completed at a cost of £9,500. Herbert K. Archibald appointed manager. 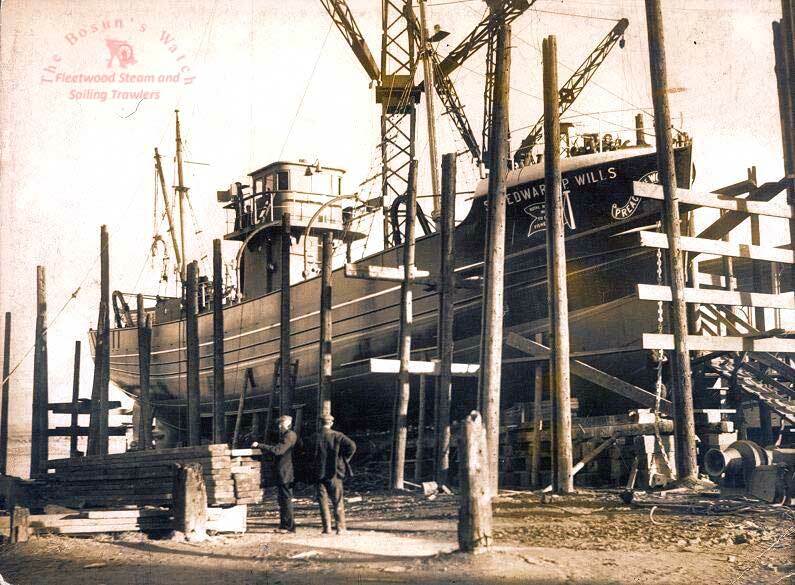 23.4.1937: Vessel sponsored by W D H O Wills Ltd, Bristol (tobacco company) and dedicated at Brixham. First skipper H. W. Thorpe, Lowestoft. 2.9.1939: Requisitioned for war service and employed on examination service (Hire rate – free). 8.1943: Employed on miscellaneous naval duties. 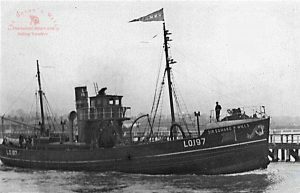 1947: Sold to Vigilant Fishing Co Ltd, Lowestoft for the sum of £10,000. 17.7.1947: Registered at Lowestoft (LT308). 21.8.1947: Registered at Lowestoft as MARY HEELEY (LT308) (BoT Minute dated 6.8.1947). David F. Cartwright, MBE MC appointed manager. 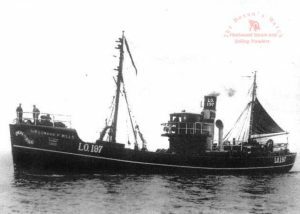 1949-1950: Seasonal white fish trawling from Fleetwood (Boston Deep Sea Fishing & Ice Co Ltd managing agents). 23.6.1949: Best landing – 73 boxes £823 gross. 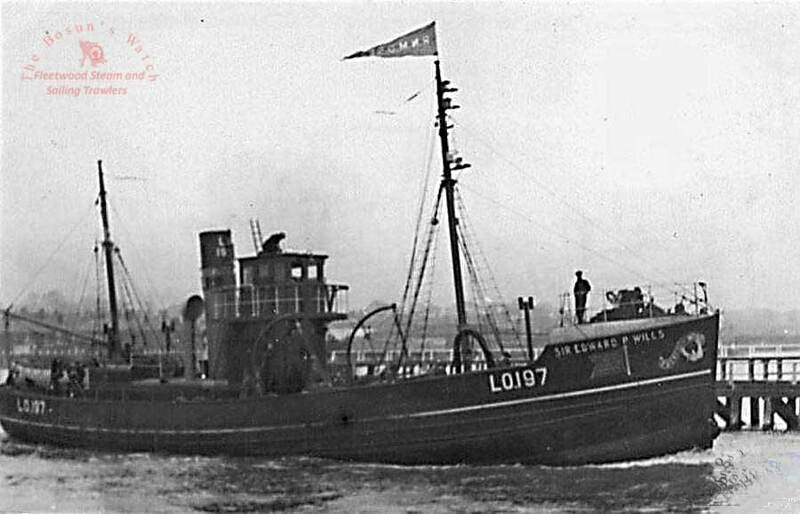 24.4.1950: Last landing at Fleetwood – 125 boxes £719 gross. 26.4.1950: Sailed Fleetwood for Irish Sea grounds (Sk. “Bubbles“ Long): ten crew total. 29.4.1950: In thick fog arrived Douglas, IoM to seek medical attention for an injured man. At 11.30pm. in improving visibility sailed Douglas to resume fishing, setting a course ENE. A little while later struck a rock and lost propeller fetching up on the rocks at Howstrake, Onchan. An SOS was sounded on the whistle and a local man pinpointed her position informing the Life Saving Corps and Douglas lifeboat. 30.4.1950: In the early hours crew taken off by Douglas lifeboat and landed at Douglas. In deteriorating weather started to break up and became a total loss. 10/02/2019: Removed FMHT watermark from image. This entry was posted in Steam Trawlers, Steamers (Picture) and tagged No Fleetwood owners on November 20, 2015 by Fred Smith.